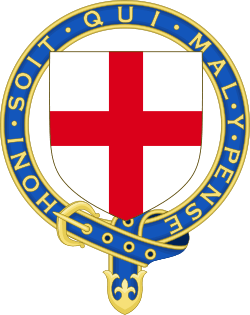 Edward Frederick Lindley Wood, 1st Earl of Halifax, KG, OM, GCSI, GCMG, GCIE, TD, PC (16 April 1881 – 23 December 1959), styled Lord Irwin from 1925 until 1934 and Viscount Halifax from 1934 until 1944, was one of the most senior British Conservative politicians of the 1930s. He held several senior ministerial posts during this time, most notably those of Viceroy of India from 1925 to 1931 and of Foreign Secretary between 1938 and 1940. He is regarded as one of the architects of the policy of appeasement prior to the Second World War, although after Hitler's occupation of the rump of Czechoslovakia in March 1939 he was also one of those who pushed for a new policy of attempting to deter further German aggression by promising to go to war to defend Poland. On Neville Chamberlain's resignation early in May 1940, Halifax effectively declined the position of Prime Minister despite widespread support across the political spectrum, as he felt that Churchill would be a more suitable war leader (his membership of the House of Lords was given as the official reason). A few weeks later, with the Allies facing apparently catastrophic defeat and British forces falling back on Dunkirk, Halifax favoured approaching Italy to see if acceptable peace terms could be negotiated, but was overruled by Churchill after a series of stormy meetings of the War Cabinet. From 1941 to 1946, he served as British Ambassador in Washington. Halifax was born into a Yorkshire family, the fourth son of Charles Wood, 2nd Viscount Halifax. He and his siblings were all sickly; his three older brothers died young, leaving him as heir to his father's fortune and seat in the House of Lords. He was born with no left hand and a withered left arm, but still enjoyed riding, hunting and shooting. 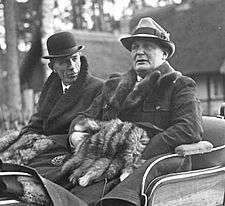 That, and his religiosity as a devout Anglo-Catholic like his father, prompted Winston Churchill to nickname him the "Holy Fox". In 2009, the family's roots were traced back to the Viking warrior, Magnus Irwinsson, who arrived in England in 1066 with the army of Harold Hardrada. Wood's childhood was divided mainly between two houses in Yorkshire, Hickleton Hall, near Doncaster, and Garrowby. He was educated at Eton and Christ Church, Oxford then became a Fellow of All Souls College, Oxford, and in 1910 was elected as Member of Parliament for Ripon, holding the seat until his elevation to the Lords in 1925. He saw some active service in the First World War as an officer in the Queen's Own Yorkshire Dragoons, rising to the rank of major, but remained mostly behind the lines after being moved to a desk job in 1917. In 1918, he and George Ambrose Lloyd (later Lord Lloyd) wrote "The Great Opportunity", a tract aiming to set an agenda for a revived Conservative and Unionist Party following the end of the Lloyd George coalition. Unwanted by the Union of South Africa for the post of Governor-General (it was holding out for a cabinet minister or member of the royal family) and snubbed by Winston Churchill on his assumption of the post of Under-Secretary for the Colonies (on one occasion he stormed into Churchill's office and told him that he "expected to be treated like a gentleman"), the thwarted Wood voted for the downfall of Lloyd George's government and became President of the Board of Education under Andrew Bonar Law in 1922. He held this position (in which he was neither interested nor particularly effective) until 1924, when he was apparently equally undistinguished as Minister for Agriculture under Stanley Baldwin. Wood's career had seemingly become bogged down. Wood was Viceroy of India from 1926 to 1931, proposed in 1925 at the suggestion of King George V (his grandfather had been Secretary of State for India). Created Baron Irwin, he arrived in Bombay on 1 April 1926 hoping to improve Anglo-Indian relations and calm interfaith tensions in the country. His rule was marked by a period of great political turmoil. The exclusion of Indians from the Simon Commission examining the country's readiness for self-government provoked serious violence, and he was forced into concessions which were poorly received: in London as excessive, in India as half-hearted. Incidents included protests against the Simon Commission Report; the Nehru Report; the All-Parties Conference; the Muslim League leader Mohammad Ali Jinnah's 14 points; the Civil Disobedience Movement launched by the Indian National Congress under the leadership of Mahatma Gandhi; and the Round Table Conferences. He had all the Congress leaders put behind bars and then opened negotiations with Gandhi. Some criticism of Irwin may have been unfair, but he had made an error and the consequences were serious and unrest grew. Irwin's attempts to mediate with Indian leaders were stymied by London's refusal to make concessions, or clarify the position on dominion status. With little room for manoeuvre, Irwin resorted to repression using his emergency powers to arrest Gandhi, ban public gatherings and crush rebellious opposition, leading to the death of Lala Lajpat Rai and the revenge attack of Bhagat Singh. Gandhi's detention, however, only made matters worse. Irwin ultimately opted to negotiate, signing the Delhi Pact in January 1931, which ended civil disobedience and the boycott of British goods in exchange for a Round Table Conference that represented all interests. The fortnight-long discussions resulted in the Gandhi-Irwin Pact, after which the Civil Disobedience Movement was suspended. On 20 March 1931, Irwin paid tribute to Gandhi's honesty, sincerity and patriotism at a dinner given by ruling princes. A month following the Gandhi-Irwin Pact, Lord Irwin's term ended and he left India. On Irwin's return to England in April 1931, the situation was calm, but within a year the conference collapsed and Gandhi was again arrested. Irwin founded the Indian School of Mines Dhanbad to develop mining and geological sciences. The same year, Irwin turned down the position of Foreign Secretary in favour of time at home. Still a firm protege of Baldwin, Irwin returned to the Presidency of the Board of Education in 1932, a position enlivened by his continuing (now backroom) role in Indian politics, his attainment of the position of Master of the Middleton Hunt in 1932 and his election as Chancellor of Oxford University in 1933. In 1934 he inherited the title Viscount Halifax from his father. In the period that followed, he held a succession of government posts: Secretary of State for War for five months in 1935, Lord Privy Seal (1935–1937) and Lord President of the Council (1937–1938), under Stanley Baldwin and later Neville Chamberlain. The appointment of Anthony Eden as Foreign Secretary in 1935 seemed initially to tie in well with Halifax's feelings about the direction of foreign policy. The two were in agreement (and in line with prevailing opinion throughout Britain) that Germany's remilitarization of the Rhineland, its "own backyard", would be difficult to oppose and should be welcomed insofar as it continued Germany's seeming progress towards normality after the tribulations of the post-World War I settlement. However, after Chamberlain succeeded Baldwin in 1937, the new prime minister began increasingly to intervene directly in foreign policy, activity for which his background had not prepared him, and which caused increasing tension with Eden. 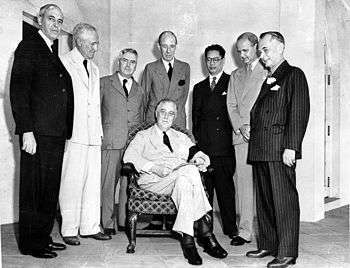 Halifax said the provisions of the Hoare-Laval Pact "were not so frightfully different from those put forward by the Committee of Five. But the latter were of respectable parentage: and the Paris ones were too much like the off-the-stage arrangements of nineteenth-century diplomacy". In November 1937, Halifax went to Germany at the invitation of Hermann Göring on the pretext of a hunting exhibition (Göring was a passionate hunter and gave Halifax the nickname Halalifax, after Halali!, a German hunting call), but Halifax was publicly and correctly regarded as acting on behalf of the British government to renew dialogue with the German government. A long and barbed meeting with Adolf Hitler ensued. On meeting the Führer, Halifax almost created an incident by nearly handing his coat to him, believing him to be a footman: "As I looked out of the car window, on eye level, I saw in the middle of this swept path a pair of black trousered legs, finishing up in silk socks and pumps. I assumed this was a footman who had come down to help me out of the car and up the steps and was proceeding in leisurely fashion to get myself out of the car when I heard Von Neurath or somebody throwing a hoarse whisper at my ear of ‘Der Führer, der Führer’; and it then dawned upon me that the legs were not the legs of a footman, but of Hitler". In discussions, Halifax ignored Eden's reservations and indicated clearly to Hitler that German designs on Austria and parts of Czechoslovakia and Poland were not regarded as illegitimate by the British, but that only peaceful processes of change would be acceptable. Writing to Baldwin on the subject of the conversation between Karl Burckhardt (the League of Nations' Commissioner of Danzig) and Hitler, Halifax said, "Nationalism and Racialism is a powerful force but I can't feel that it's either unnatural or immoral! I cannot myself doubt that these fellows are genuine haters of Communism, etc.! And I daresay if we were in their position we might feel the same!" The following year Eden resigned, exasperated by the continued interference of the Prime Minister in foreign affairs and his increasingly determined policy of appeasement (particularly of Benito Mussolini, whom Eden regarded as an untrustworthy gangster). For Halifax, as for Chamberlain and the Chiefs of Staff, every effort had to be made to prevent an alignment of the three great threats to peace and the British Empire: Italy, Germany, and Japan. Halifax replaced Eden as Foreign Secretary in February 1938. Halifax commented "I have had enough obloquy for one lifetime" (i.e. as Viceroy of India) before accepting appointment as Foreign Secretary. Chamberlain embraced the policy of appeasement as a moral force for good, as did many others who were deeply opposed to war and defence spending. By comparison, Halifax's policy appears more pragmatic, like that of Samuel Hoare, coupled to a firm commitment to rearmament, albeit unenthusiastically. All parties recognised the hostility of public opinion to war or military preparations, and the difficulty of acting without a readiness on the part of America or the Soviet Union to play their part (the Labour Party opposed rearmament until well after Munich). Nonetheless, Halifax was criticised as an appeaser, along with Chamberlain, Hoare, and twelve others, in the anonymous 1940 book Guilty Men. In March 1938, Hitler annexed Austria, and Czechoslovakia was clearly next on the agenda, with neither Britain nor France having the military capacity to support Czechoslovakia. Halifax remained in London at the key moments of the Munich crisis of September 1938, where Chamberlain's personal intervention was dramatic. It was during the Munich crisis that Halifax began to take a stronger line than Chamberlain against further concessions to Germany. It appears that a frank conversation with his pugnacious Permanent Secretary Sir Alexander Cadogan brought Halifax to the sharp realisation that the road to appeasement had taken Britain into a series of concessions that were unwise and that were unlikely to secure the necessary pacification of Germany. Andrew Roberts argues that from this point on, Halifax set his face firmly towards a policy of deterrence. He hoped that increased rearmament, including the reintroduction of conscription, strengthening of alliances with and economic support to the countries of Eastern Europe, coupled with a firmer line towards Germany, Italy, and Japan would reduce the risks of the those three hostile powers acting in combination (it is of note that, when war did begin, neither Japan nor Italy was prepared to join in until the pendulum had swung much further in Germany's favour). On 25 September 1938 Halifax spoke out against the inflated demands presented by Hitler at Bad Godesberg. 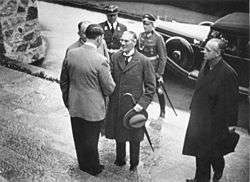 The eventual Munich agreement, signed after Chamberlain's third summit meeting with Hitler, was apparently popular around the world and humiliating to many in the British government, but it was short of Hitler's desires (and of Chamberlain's proposed concessions) and increased Hitler's determination to return to destroy Czechoslovakia in the spring. In the following months, Hitler's lack of commitment became clearer regarding the Munich agreement. Halifax worked steadily to assemble a stronger British position, pushing Chamberlain to take economic steps to underpin British interests in Eastern Europe and prevent additional military supplies from reaching Germany, such as tungsten. Halifax granted a guarantee to Poland on 31 March 1939, triggered by alarming intelligence of German preparations, in hopes of sending clear signals to Germany that, in Halifax's words, there would be "no more Munichs". Birger Dahlerus approached Britain for peace talks in August 1939, just before the outbreak of war. Again, on 1 November 1939, Halifax replied to an approach through Swedish channels that no peace was possible with Hitler in power. Even that aroused the wrath of Churchill, not yet Prime Minister, who sent a private note to Halifax rebuking him that such talk was dangerous. In early April 1939, the Foreign Office received intelligence that Italy was about to invade Albania. At a Cabinet meeting on 5 April 1939, Halifax rejected these reports. Two days later, Italy invaded Albania; Halifax met Sir Alexander Cadogan and "decided we can't do anything to stop it". In the early days of the war, January 1940, Halifax met an emissary of Ulrich von Hassell, a leading member of the German resistance, who stated that "he personally would be against the Allies taking advantage of a revolution in Germany to attack the Siegfried Line." On 8 May 1940, Chamberlain's government survived a motion of no confidence brought about by the deteriorating military situation in Norway. The government had a nominal majority of 213 in the House: at the end of the "Norway Debate", they won the vote with a majority of only 81; 33 Conservatives and 8 of their allies voted with the opposition parties, and 60 abstained. Churchill never had a good relationship with Chamberlain and had only grudgingly been appointed First Lord of the Admiralty. Nevertheless, he mounted a strong and passionate defence of Chamberlain and his government in the debate preceding the vote. Chamberlain held a meeting the following day attended by Halifax, Churchill, and the leader and the deputy leader of the opposition Labour Party (Clement Attlee and Arthur Greenwood respectively). He asked the Labour leaders if they would agree to serve in a coalition government. They replied that they were not sure whether this would be possible in a government led by Chamberlain but that it might be possible with a different Prime Minister. However, before they could officially answer, they would need to consult the rank and file members of the Labour Party, then at its annual conference in Bournemouth. They were asked to telephone by the following afternoon with the result of the consultation. Churchill's own account of these events is misleading, written six years later. It describes the events of the 9th as having taken place the following day, and the description of Chamberlain attempting to persuade him to agree tacitly to Halifax's appointment as Prime Minister does not correspond with Halifax's having expressed his reluctance to do so to Chamberlain at a meeting between the two men on the morning of the 9th. The Labour leaders telephoned at 5 p.m. on the 10th to report that the party would take part in a coalition government, although it had to be under the leadership of someone other than Chamberlain. Accordingly, Chamberlain went to Buckingham Palace to tender his resignation, recommending that the King ask Churchill to form a government. On doing so, one of Churchill's first actions was to form a new, smaller War Cabinet by replacing six of the Conservative politicians with Greenwood and Attlee and retaining only Halifax and Chamberlain. Churchill's political position was weak, although he was popular with the Labour and Liberal Parties for his stance against appeasement in the 1930s. He was unpopular in the Conservative Party, however, and he might not have been the choice of the King. Halifax had the support of most of the Conservative Party and of the King and was acceptable to the Labour Party. His position as a peer was a merely technical barrier given the scale of the crisis, and Churchill reportedly was willing to serve under Halifax. As Lord Beaverbrook said, "Chamberlain wanted Halifax. Labour wanted Halifax. Sinclair wanted Halifax. The Lords wanted Halifax. The King wanted Halifax. And Halifax wanted Halifax." Only the last sentence was incorrect, however; Halifax did not want to become Prime Minister. He believed that Churchill's energy and skills as leader of a desperate cause were superior to his own. Like Chamberlain, he served in Churchill's cabinet but was frequently exasperated by Churchill's style of doing business. Germany invaded Belgium, the Netherlands, and France on 10 May 1940, the day that Churchill became Prime Minister. On 22–23 May, the German army reached the English Channel, isolating the British Expeditionary Force. Churchill soon had a confrontation with Halifax who believed that the United Kingdom should try to negotiate a peace settlement with Hitler, in view of the successful German invasion of France and the encirclement of British forces at Dunkirk, using Mussolini as an intermediary. Churchill disagreed, believing that "nations which went down fighting rose again, but those which surrendered tamely were finished" and that Hitler was unlikely to honour any agreement. Moreover, he believed that this was the view of the British people. On 24 May, Hitler issued the order for his armies to halt before they reached Dunkirk. Two days later, the British and French navies began an evacuation of the Allied forces, assisted by the Royal Air Force. Between 25 and 28 May, Churchill and Halifax fought to bring the British War Cabinet around to their own respective points of view; by 28 May, it seemed as if Halifax had the upper hand and that Churchill might be forced from office. However, Churchill outmanoeuvred Halifax by calling a meeting of his 25-member Outer Cabinet, to whom he delivered a passionate speech, saying, "If this long island story of ours is to end at last, let it end only when each one of us lies choking in his own blood upon the ground", convincing all who were present that Britain must fight on against Hitler whatever the cost. Churchill retained Halifax as Foreign Secretary for seven months, but the two men had never enjoyed a close relationship. In the spring of 1940, there were heated Cabinet discussions as France teetered towards defeat. Halifax energetically participated in the debates for and against a recourse to total war and lone opposition to Germany, whatever the cost to Britain's long-term military and economic standing. 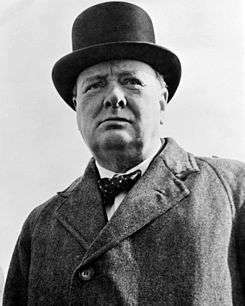 The Cabinet believed that Italian offices might open peace negotiations, and Churchill argued that playing for time was in Britain's interest. Halifax, however, was concerned that the British Expeditionary Force (BEF) would be destroyed and that Britain would lose its last bargaining chip. Churchill won the argument, and the BEF was saved at Dunkirk. In January 1941, Halifax was sent to Washington, D.C. on the death of Ambassador Marquess of Lothian. 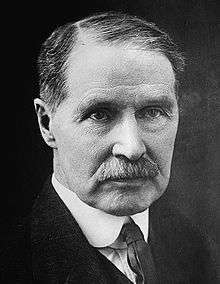 He was the last man linked with appeasement to leave the Cabinet, as Chamberlain had died, and both Hoare and Simon had already departed. Halifax was a cautious and elusive public figure, not an effective public diplomat like his predecessor. His relations with Franklin D. Roosevelt were satisfactory, but Halifax kept a low profile. Churchill's close engagement with the United States and his investment in personal communication with the President meant a more constrained role for the British Ambassador. Communications technology meant that Churchill could communicate directly with Roosevelt and was a regular visitor to Washington. Relations also increasingly turned on military issues channelled through the Joint Chiefs of Staff secretariat in Washington. 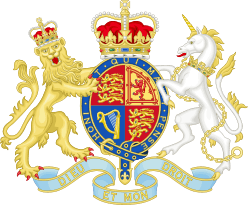 In 1944, he was created Earl of Halifax, the fourth creation of the title. Halifax wearied of Washington, in mourning the death of his middle son in action in 1942, and he asked Anthony Eden to find someone to replace him; but he stayed until 1946, witnessing the transition to Harry S. Truman and Clement Attlee. Those years contained fraught moments and challenges for the relationship, as American power eclipsed that of Britain, and Britain's interests and rights were ignored on occasion, in particular, the cessation of nuclear co-operation after construction of the atom bomb. However, the partnership in World War II was immensely successful and as close as any other such partnership. It was a demanding post by any standards, but Halifax could reasonably claim to have played his part, and he enjoyed a notably longer term than his less successful successor Archibald Clark Kerr, 1st Baron Inverchapel. Halifax took part in a plethora of international conferences over the UN and the Soviet Union but, again, he believed that Churchill's view of the Soviet threat was exaggerated and urged him to be more conciliatory. His 1957 autobiography The Fulness of Days was described in the Dictionary of National Biography as "gently evasive". In retirement from 1946, he returned to largely honorary pursuits as Chancellor of the University of Sheffield and the Order of the Garter and Chairman of the BBC. He died at age 78 at his estate at Garrowby shortly before Christmas 1959. In 1968, the official records were released of Halifax's years as Foreign Secretary (the "fifty-year rule" was replaced by the "thirty-year rule"). Conservative historian Maurice Cowling argued that Halifax's stance of increasing resistance to Hitler, especially the Polish guarantee in the spring of 1939, was motivated by a need to keep ahead of a sea-change in British domestic opinion. He wrote in 1975: "To history, until yesterday, Halifax was the arch-appeaser. This, it is now recognised, was a mistake. His role, however, was complicated. In these pages he is not the man who stopped the rot, but the embodiment of Conservative wisdom who decided that Hitler must be obstructed because Labour could not otherwise be resisted." Halifax married Lady Dorothy Evelyn Augusta Onslow (1885–1976), daughter of William Onslow, 4th Earl of Onslow, on 21 September 1909. Lady Dorothy later became The Right Honourable Dorothy Evelyn Augusta, Countess of Halifax, CI DCVO. ↑ Keith Feiling, A Life of Neville Chamberlain (London: Macmillan, 1970), p. 275. ↑ The Earl of Halifax, Fulness of Days (London: Collins, 1957), p. 185. ↑ Andrew Roberts, ‘The Holy Fox’. The Life of Lord Halifax (Phoenix, 1997), p. 67. ↑ Jago 2015, p. 85. ↑ "Britain to increase spending on arms". The Guardian. Retrieved 2 September 2013. ↑ Jago 2015, p. 106. ↑ Howard 1987, p. 96. ↑ Christopher Andrew, The Defence of the Realm. The Authorized History of MI5 (London: Allen Lane, 2009), p. 208. ↑ "Conduct of the War". Hansard. 8 May 1940. Retrieved 2 January 2013. ↑ Jenkins 2002, p. 582. 1 2 Jenkins 2002, p. 586. ↑ Jenkins 2002, p. 583. ↑ Blake, Robert (1993). "How Churchill Became Prime MInister". In Blake, Robert B.; Louis, William Roger. Churchill. Oxford: Clarendon Press. pp. 264–270. ISBN 0-19-820626-7. ↑ "Churchill decides to fight on". BBC. Retrieved 1 January 2013. ↑ Martin, Stanley (2007). 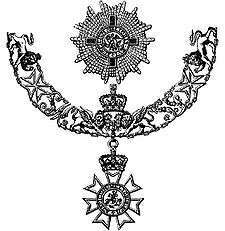 The Order of Merit: one hundred years of matchless honour. London: I. B. Tauris. p. 375. ↑ A Gentleman with a Duster [pseud. for Harold Begbie], The Conservative Mind (London: Mills & Boon, 1924), pp. 47–48. ↑ Harold Macmillan, Winds of Change (London: Macmillan, 1966), p. 531. ↑ Lord Butler, The Art of the Possible (London: Hamish Hamilton, 1971), p. 77. ↑ Maurice Cowling, The Impact of Hitler: British Politics and British Policy, 1933–1940 (Cambridge University Press, 1975), p. 9. ↑ "Making history with brick and mortar". Hindustan Times. 15 September 2011. ↑ The London Gazette: (Supplement) no. 32759. p. 7527. 24 October 1922. Retrieved 11 May 2015. ↑ The London Gazette: no. 33117. p. 8567. 25 December 1925. Retrieved 11 May 2015. ↑ The London Gazette: no. 33139. p. 1667. 5 March 1926. Retrieved 11 May 2015. 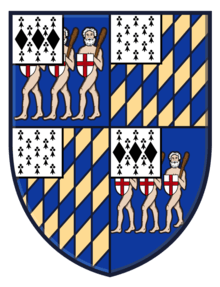 ↑ Lady Anne Dorothy Wood profile, thepeerage.com; accessed 27 March 2016. 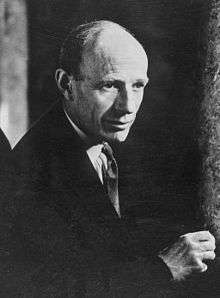 Roberts, Andrew, The Holy Fox The Life of Lord Halifax. London, 1991. Andrew Roberts, ‘The Holy Fox’: The Life of Lord Halifax (Phoenix, 1997). Wikimedia Commons has media related to Edward Frederick Lindley Wood, 1st Earl of Halifax.